The days are getting longer, the beaches are filling up and the barbecues are starting to sizzle. This can only mean one thing. Christmas is officially on the way! With the season of giving almost upon us, what better way to celebrate than by giving the gift of health. 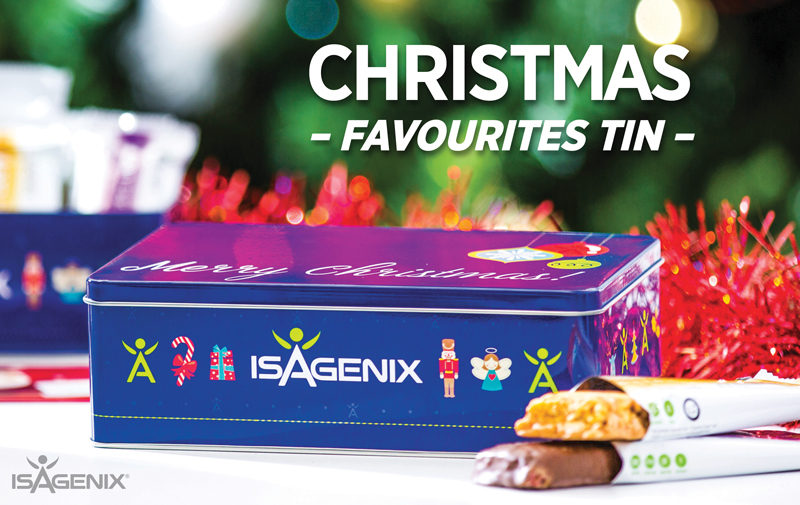 Introducing a tasty, seasonal offering that everyone is sure to love – the Christmas Favourites Tin – a delicious selection of your favourite IsaLean bars in an irresistibly festive tin! What’s good for you is good for those you care about, too. Celebrate the season of giving while staying focussed on healthy living, with these nutritious and delicious treats. The perfect gift for friends, family (or a Christmas pressie for yourself), the Christmas Favourites Tin has you and your guests spoilt for choice with 12 scrumptious IsaLean Bar favourites! Giving a delicious, guilt-free gift just got easier! Shopping centres are bursting at the seams during the festive season. Don’t waste precious time standing in long lines or queueing in carparks when you can be spending time with family and friends. Shop from the comfort of your own home through the Back Office or on the go via the IsaOrder app. It doesn’t get any easier than that! Available while stocks last, get your Christmas shopping finished early and allow more time for fun! Stock is strictly limited and available through Wholesale orders only so don’t sit on this offer – get yours today to avoid missing out!